If you’ve ever looked inside your kettle or boiler, chances are you’ve probably spotted a tough, stony, off-white crust at the bottom of it. This is limescale, the deposit left behind by hard water. Hard water contains higher than average levels of dissolved minerals. Rainwater is naturally ‘soft’, containing few impurities. If it runs over tough rocks like granite or slate it stays this way. But if the water runs through soft, spongy rocks, like limestone or chalk, it absorbs minerals from them. These minerals, often calcium or magnesium carbonate, are what make the water become hard. Hard water itself isn’t necessarily a problem. For years people have been enjoying the healing effects of it. In fact, the health benefits of mineral-rich springs such as those in Bath are legendary.Unfortunately, hard water has other, less pleasant, side-effects. For example, hard water is more difficult to wash in, as soap doesn’t lather as well and can leave behind a light scum on surfaces. Some common detergents are also less effective, meaning clothes can end up looking dirty even after being washed, and that plates and glasses can look dull over time. Hard water can also cause sensitive skin to become dry and irritated. If hard water is heated past 55°C or left to stand, the dissolved minerals in it solidify as the moisture evaporates. These solidified minerals are what limescale is made of, and they can be a serious problem in the home. 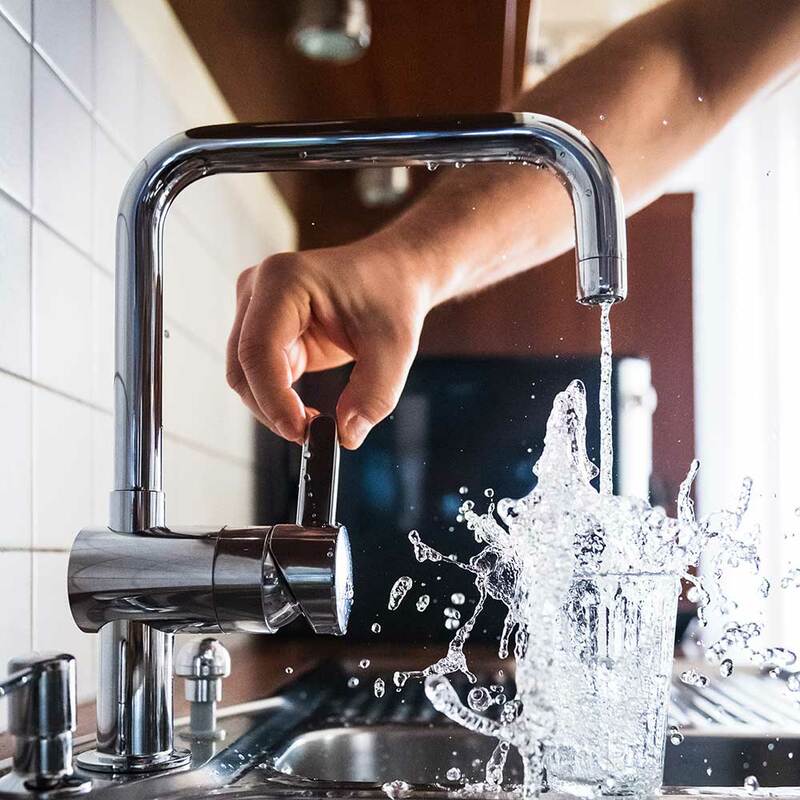 As you’ve probably noticed in your own home, limescale will often cover taps and hard surfaces with an unsightly layer which can be difficult to remove. The visible effects, however, are nothing compared to those effects which can’t be seen. Hard water contains an average of 300mg of dissolved minerals per litre, so a four person household can accumulate up to 70kg of limescale in a year. A significant amount of this stays inside central heating pipes, clogging them up. Limescale also coats the heating elements of your boiler, washing machine, and dishwasher in the same way that it covers your kettle, thus making them less energy-efficient. In fact, British Water say that even a 1.6mm coating of limescale on a heating element can make it up to 12% less effective. This could cause you to waste up to £200 worth of energy every year. It could also cause your appliances to burn themselves out much more quickly than normal. As Great Britain is largely made up of limestone and chalk, around 60% of homes in England and Wales are supplied with hard water. Fortunately for us there are a number of ways to deal with it. Most houses in hard water areas therefore treat water as it enters the house. This can be done in two ways – water softening and, more recently, water conditioning. As water enters the domestic system, it passes through an ion exchange column filled with thousands of tiny beads of resin. This resin has charged sodium attached to its surface and it swaps this for the more reactive calcium and magnesium as water flows over it. The resin can continue to do this indefinitely as long as it is washed through with salt water every so often to wash off the calcium and magnesium and replace the sodium. Most modern columns will automatically rinse themselves if regularly provided with salt. Water conditioning follows a far more hi-tech route. Here, a water conditioner is attached to the pipes to expose the water to a low level magnetic or radio field. This field causes tiny impurities in the water to clump together. This will reduce limescale because these clumps form a better surface for the dissolved minerals to stick to than the inner surface of the pipes, making them more likely to stay suspended in the water. If the water is left to stand, the minerals can form a kind of white sludge called ‘soft scale’, but this only accumulates in water tanks and is far easier to remove than a rock-hard layer of limescale. Opinion is divided over which of these two methods is better. Water softening is tried, tested and known to be effective. It also has the added benefit of removing the calcium, making the water more pleasant to wash in and less irritating to sensitive skin. Unfortunately, it also increases the sodium content of the water, so much so that people are advised to keep a separate, untreated tap for drinking water.Softening is also the more expensive option. It costs an average of £430 to install a softener, depending on the size, and approximately £1.50 a week to run it, as softeners need a constant addition of salt. Water conditioners, on the other hand, cost an average of £120 to buy and have negligible running costs. They also keep the sodium content of the water low enough that it can still be drunk after treatment, as they do not soften water. The problems with washing, however, may still apply. Water conditioners have the added benefit of being easier and cheaper to install. As most manufacturers offer a money-back trial period, the benefits certainly make trying out a conditioner worth the effort. Our engineers are happy to discuss the various options available to you.